TELENAV | Can Experience Benchmarking really help make better products? If you’ve ever taken a survey with a similar question, you participated in a Net Promoter Score (NPS) study. What separates an NPS survey from your ordinary survey is that an NPS is more honed to the specific feelings and eventual actions of the customer. Originally created by Fred Reicheld and Bain & Company, it’s the one number that predicts an organization’s future success by measuring the customer’s experience. Also, it helps determine their willingness to not only return for another purchase or service but also make a recommendation to their family, friends or colleagues. The main advantage of an NPS survey is that it provides timely data that’s easily collected, interpreted and communicated across all channels of the business. It is a powerful and effective tool, which can greatly increase a company's revenue if used properly. ‍Promoters—responded with a score of 9 or 10. They have a high potential to create future value for a company such as future upsell and cross-sell purchases, longer customer loyalty, and promoting the product or brand to other potential customers. Detractors—responded with a score of 0 to 6. They are less likely to create future value for the company. In fact, they may deflect potential customers. Passives—responded with a score of 7 or 8. They are the middle ground between Promoters and Detractors. The NPS scale goes from -100 to +100 and interpretation depends on industry, but consider a score above 20 to be good, over 35 to be excellent, and above 50 as world class as a starting point. 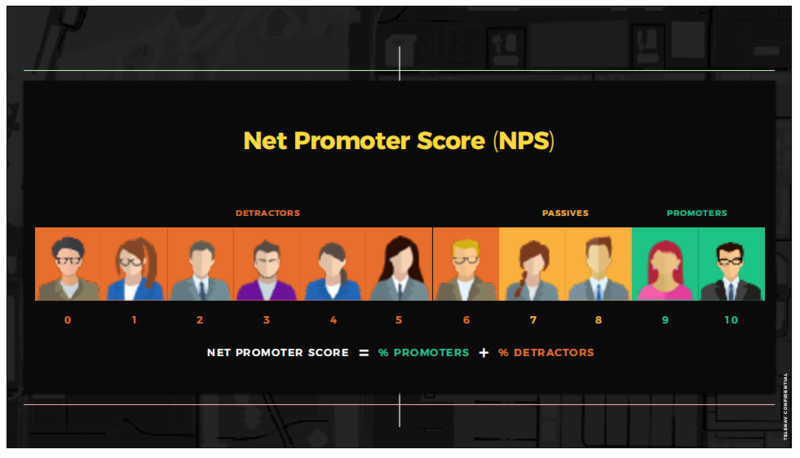 Over the past decade, many companies have adopted the Net Promoter Score as a critical measurement of the current customer satisfaction. In fact, 45% of companies that use NPS alone are among 2/3 of Fortune 1000 Companies. In the automotive industry, NPS is already been used extensively by companies like VW, GM and Toyota. A promoter or a regular customer affects profitability. Acquisition costs go down when retention is high. Simple math - while regular customers aren’t always profitable, their choice to stick with a product or service typically reduces a company’s customer acquisition costs. Customer follow up on the NPS lifecycle is key. While we need to follow up on bad scores with customers, we also need to follow up with the good customers who retain longer. What about traditional survey methods? An advantage of NPS is that it takes seconds to answer a single question versus many minutes for a lengthy customer satisfaction survey. However,there’s still a place for the deep detail that a traditional survey provides, NPS data is much easier to collect, faster to analyze and has a higher customer engagement rate. NPS is also well suited to deployment via the web or mobile devices. Originally created by John Brooke in 1986, the System Usability Scale (SUS) allows you to evaluate a wide variety of products and services, including hardware, software, mobile devices and applications. The SUS is a reliable tool for measuring usability. It consists of a 10-item questionnaire with five response options for respondents, ranging from Strongly Agree to Strongly Disagree. Telenav conducts cross-manufacturer benchmark studies on automotive infotainment and navigation systems with over 5,000 participants to date in the US and globally on a regular basis. We are Industry Leaders with unparalleled depth and breadth of data on navigation and are leaders in NPS and its relevance to the auto industry. Our consulting services do everything within the value chain from concept development to “Usability and Design Evaluation” to “How to achieve higher NPS scores for OEMs”. Our benchmarking Services within the consulting arm provide you with the 3 standard products- Net Promoter Score, Brand Experience Score and System Usability Score. In a recent survey of 4000 navigation users across the United States, Telenav researchers discovered that women are almost twice as likely as men to listen to voice guidance from their navigation system. Our next article in this series will explain the use of Brand Experience, a more in-depth measure, as the third metric for experience benchmarking, that diagnoses specific problem areas to improve products. To learn more about Telenav’s UX consulting and benchmarking services, write to us at hmx@telenav.com.